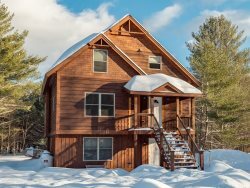 Driving directions to the Bethel / Sunday River area | Maine Ski Lodging Co.
Bethel is easily accessible from all major eastern cities, as well as from several northeastern international airports. Our physical address is 16 Parkway Road, Bethel ME, 04217. Most guests arrive in the Bethel / Sunday River area iby car. From the greater Boston area, take Interstate 95 north to the Maine Turnpike, at mile 63, take Exit 63, Gray, Maine. Then follow Route 26 north for approximately 50 miles. Bethel is located at the intersection of Route 26 and Route 2, which is the major northern New England east / west highway corridor. Public transportation around Bethel is available in the winter only. The Mountain Explorer provides free shuttle service between the village of Bethel and Sunday River resort.